Since our approach to market was published last Thursday, more than 350 new sellers have applied to join the Digital Marketplace. The marketplace expansion includes more sellers, more expertise and more features to make procurement simpler, clearer and faster. Caption: The Digital Marketplace site shown on 3 devices. With our latest release we believe we’ve made significant advances in breaking down barriers so that it’s easier for businesses of all sizes to work with government—and easier for government to work with business. In addition to services, sellers can showcase their digital products. This is a first step to selling digital products through the Digital Marketplace. That functionality will be available in a future release. Best of all, from now on we never close. New sellers can onboard at any time. Since our approach to market was published last Thursday, over 350 new sellers have applied to join. Before sellers can apply for an opportunity they need to be approved to join the Digital Marketplace panel, which means they are appropriately assessed for digital expertise and corporate stability. The Digital Marketplace also hosts a directory of new-to-government non-panel sellers. Their application to the Digital Marketplace represents the first step in introducing themselves to government. Search—to help buyers find what they need more easily we’ve given them keyword search. A timely addition as seller profiles have been expanded to include case studies and badges to create a complete digital shopfront to government. Badging diversity—through self-identification sellers can make it easier for buyers to find businesses who can contribute to their procurement diversity aims. For example, the ‘Indigenous’ badge can be displayed by businesses owned by Aboriginal and Torres Strait Islanders to help buyers meet targets set out in the Indigenous Procurement Policy. Document management—by storing sellers insurance and financial information centrally we make buyers’ due diligence simpler and avoid sellers having to supply the same documents many times. Scalable contracts—the Digital Marketplace panel legal agreement is now an online, modular contract that is designed to scale for procurements from simple to complex. Guidance and coaching—the Digital Marketplace offers guidance and coaching to buyers on how to structure, write and assess briefs for the digital age. If you need a hand all you need to do is email us. 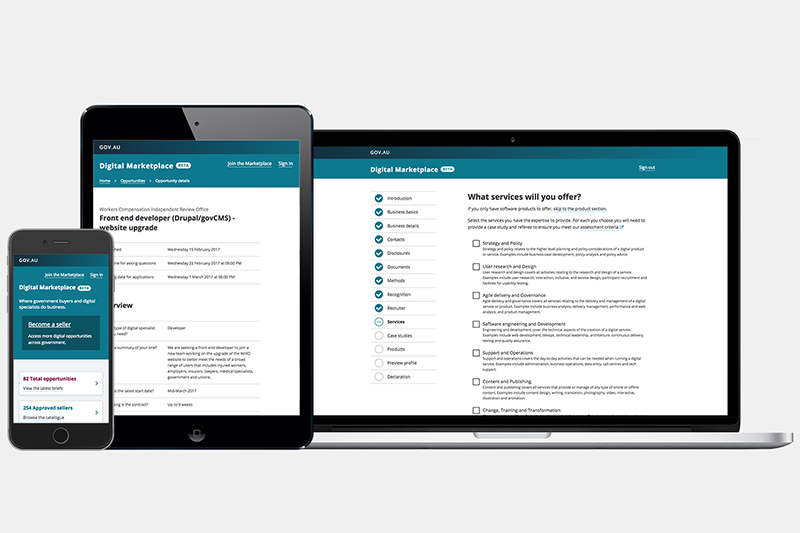 We’ve made it easier for digital businesses of all sizes to work with government. With a single application to join the Digital Marketplace, that can be completed at any time, you can access opportunities published by hundreds of buyers across local, state, territory and federal government. The application can be completed quickly and easily and serves a dual purpose. First, to create a content rich seller profile to keep and curate. And second, for the assessment that ensures each seller meets the appropriate quality standard for working with government. This application is now open to new sellers and to current sellers who wish to expand the services they offer. In a few weeks digital procurement is about to get easier. In compliance with Commonwealth Procurement Rules a minimum of 25 days must pass after an approach to market before we can form the Digital Marketplace panel. All the new features and functionality described here will be available to buyers when the new panel is formed. In the meantime you can still create an account and publish new opportunities. If you work in government and have an email address ending in gov.au create a buyer account now. If your government email address is different, you can request a buyer account by emailing marketplace@digital.gov.au. Steven Berends is the Digital Marketplace content designer.